Quality of life and life expectancy generally tend to increase significantly for kidney patients given a kidney transplant. The transplant of a healthy organ is currently the best treatment option to prevent the permanent loss of kidney function. Can I be transplanted to at all? What do I do in order to be capable of being transplanted to? Is it possible for someone close to me to donate a kidney? Is the transplant surgery dangerous? What are the chances of success of such an operation, after many years of renal replacement therapy? We will gladly answer your questions. We also clarify together with you whether an organ transplant is medically appropriate for your case, and will conduct the necessary preliminary investigations. We will spend a lot time with you during the preparatory phase of the transplant. Because during this important step we want a competent contact person to be at your side, and with whom you feel safe. The prepared donor kidney is placed in the lesser pelvis. 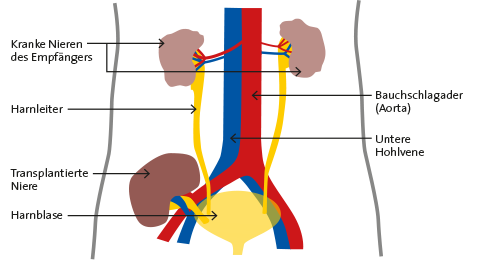 It is then connected to the iliac artery, iliac vein, and urinary bladder of the recipient. The body's own kidneys are usually not removed. Immunomodulating drugs prevent the new organ from being rejected by the immune system. Regular monitoring of renal function ensures the success of the transplant.g of renal function ensures the success of the transplant. We will also put you in contact with the transplant centre at the University Hospital in Freiburg, whom we have been working with very closely for years. Kidney transplants have been performed there since 1968. The combination of intensive consultation and cooperation with the University Hospital of Freiburg, one of Germany’s leading transplant centres, guarantees that you will have outstanding support before your surgery through the Markgräflerland Professional Internal Medicine Joint Practice. Once the transplant has been successfully performed, continuous follow-up care is of the utmost importance. Firstly, the donor kidney has to be prevented from being rejected by the body’s immune system. Lifelong use of immunomodulating drugs is necessary in this case. Transplant patients are also vulnerable to infectious diseases. Accurate and regular monitoring is therefore essential to ensuring the success of a transplant. The Markgräflerland Professional Internal Medicine Joint Practice ensures this with our specialized doctors. We are supported in this with state of the art diagnostic methods and technology, enabling us to offer you the best care and treatment for your kidney transplant. This includes for us the psychological preparation that should not be neglected in such an operation – in order for you to enjoy your newfound quality of life after the transplant. We will optimally prepare you for your transplant, ensuring close and responsible aftercare.